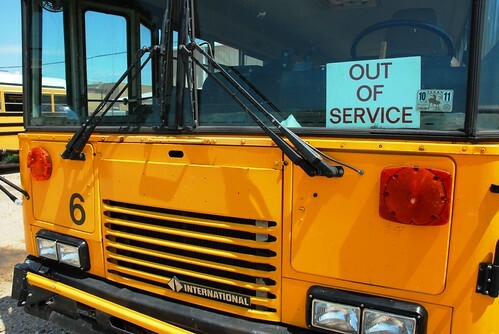 I never thought I'd see the day when the "Out of Service" sign would be posted on Bus No. 6. For buses, that sign is the kiss of the death. It's like having the mechanic take one look at your car and declare it's cheaper to buy a new one than to fix it. It's like hearing your soon-to-be inlaws whisper to your soon-to-be wife, "You do this, and we're cutting you out of our will." It's like your doctor saying you have only six weeks to live, but it might be just one. Bus No. 6, out of service. Who knows if it's just a termporary thing or permanent? If the mechanics know, they're not talking. ...I'm buying it and parking it in my backyard. I'm going to turn it into my clubhouse.